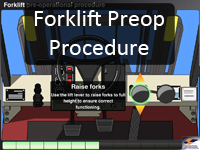 This flash game takes the user throught the correct startup procedure for a standard commercial forklift. This video provides an interesting and fun approach to learning about risks. In this video users must use the correct fire extinguisher to put out different types of fires. This movie teaches users how to identify hazards. Users can watch this video to learn the definition and importance of risk assessment. This video describes the legislation that governs the ABC organisation, and explains that it is a Commonwealth Agency. This movie teaches users how to sort laundry they have received. In this movie users search for sharps and foreign objects and learn how to correctly dispose of discovered items. This video teaches users the different types of personal protective equipment that should be used when working in the Laundry Industry. Handwashing. In this video users follow the steps to learn how to effectively clean hands.